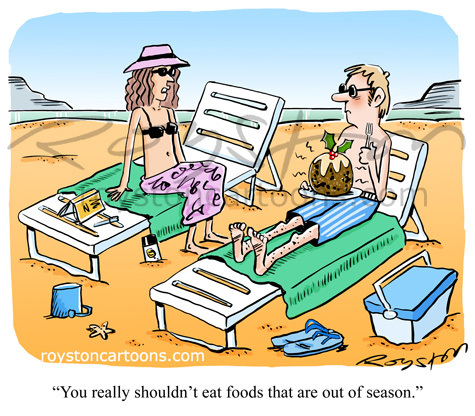 As the summer holidays approach, here's a nice, sunshiny beach cartoon from the July issue of Reader's Digest. I was also commissioned to do two cartoons for the Money pages this month. It's nice to see them using gag cartoons for this, rather than "straight" illustrations, for a change. More magazines should do that. After all, cartoons are better value for readers as you get a chuckle too (hopefully). And I think we all need more of those at the moment. This cartoon was used as one of the Beat the Cartoonist gags at this year's Shrewsbury Cartoon Festival. Unlike the magazine version of this game they simply picked a winner, it didn't compete with the cartoonist's original caption. 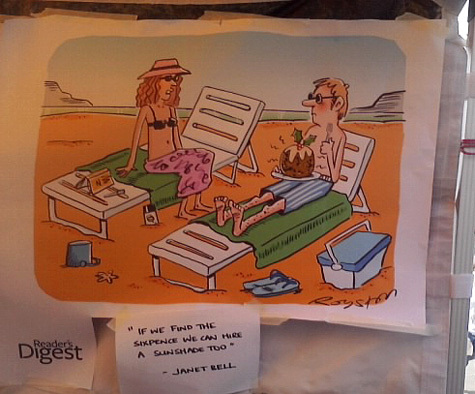 The winner was Janet Bell with "If we find the sixpence we can hire a sunshade too". You may well think that's an improvement. I couldn't possibly comment. 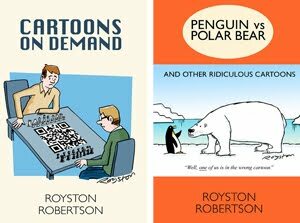 Here's a blog post from last year on previous appearances in the magazine version of Beat the Cartoonist. It's you, Raymond! Shrewsbury is the only one dedicated to humour cartoons i.e. editorial, gags, strips. There are others that are mostly about comics, but still nothing like the scale we see in France, for example. It probably just seems like a lot as we're always going on about Shrewsbury! Oh well, just wishful thinking on my part as usual. Thanks Royston! Love the guy tucking into a whole Christmas pud on holiday. Such a silly image. Yeah, I think the contrast of summery beach and the sprig of holly helps, somehow. Yes, I saw your cartoons in the Money section and wondered if they'd been done specifically for it. Delighted to hear that they were! Good work Royston! Can you beat the cartoonist?